In a world of ever-evolving machinery, putting safety first becomes more important with each new innovation. All across the globe, millions of construction workers, machine operators, and other employees attend meetings specifically held to drive home the importance of safety in the workplace. Unfortunately, not everyone takes the message about safety to heart and can end up in some precarious situations. 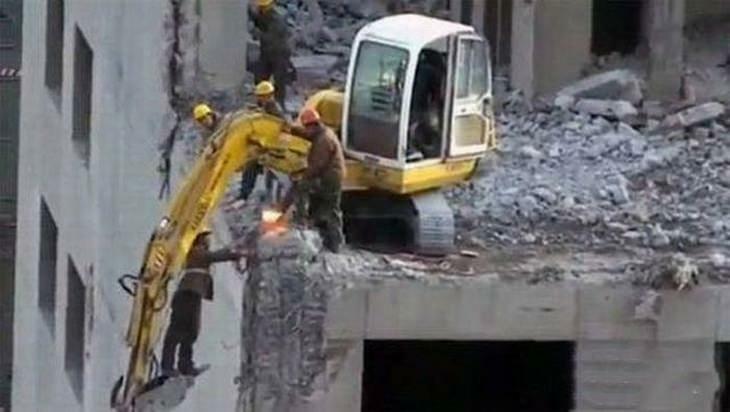 Be prepared to put face in palm as you view 15 of the most asinine safety fails on the planet! 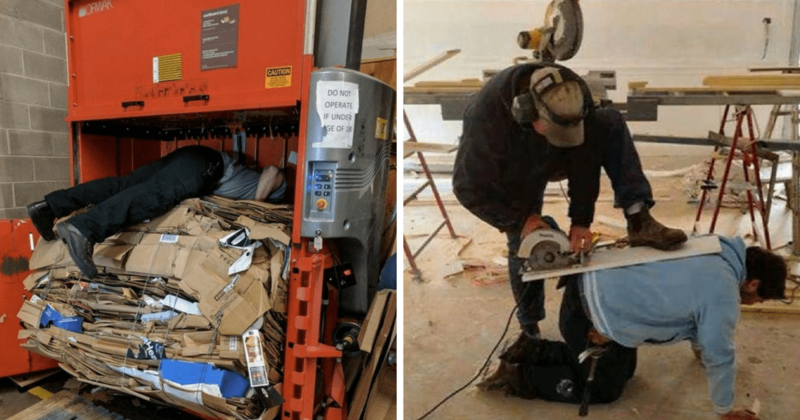 Recycling is important, but is it lose-a-limb important? 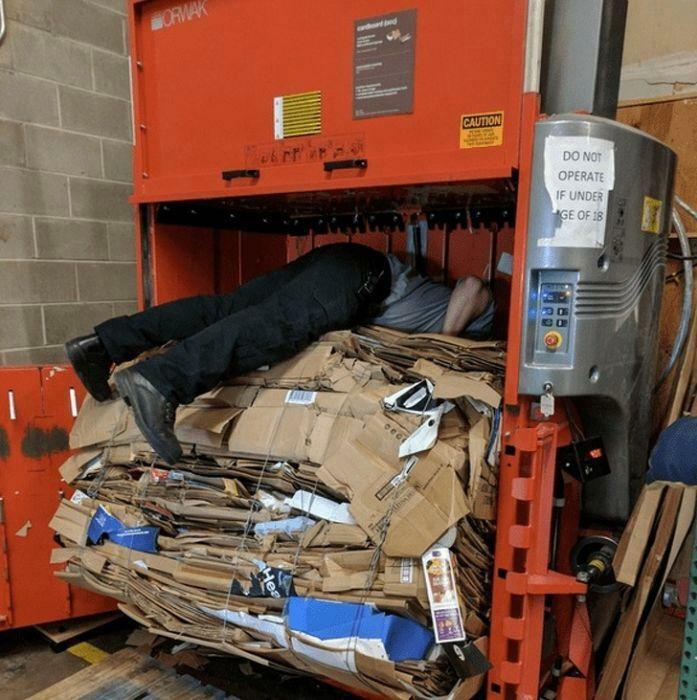 This paper shredding machine operator sure seems to think so! 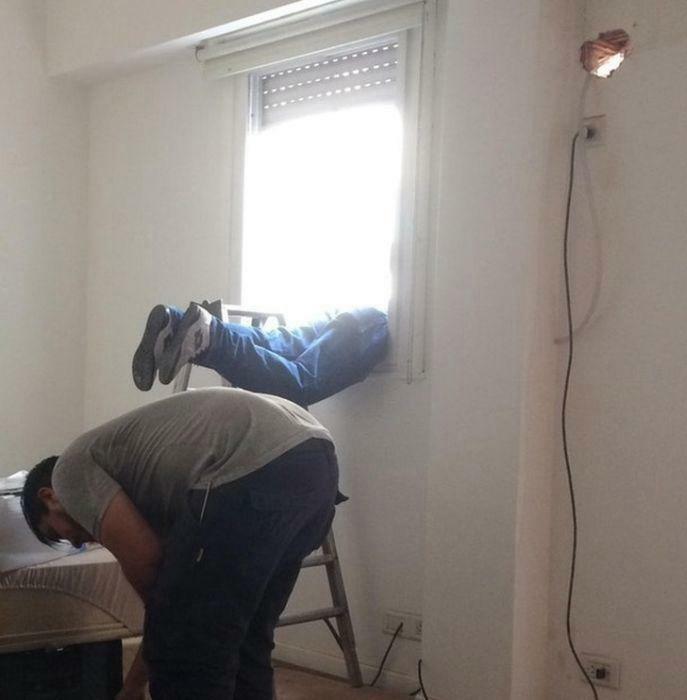 Anything to get the job done…right? This guy seems to think scaffolding is for pansies. 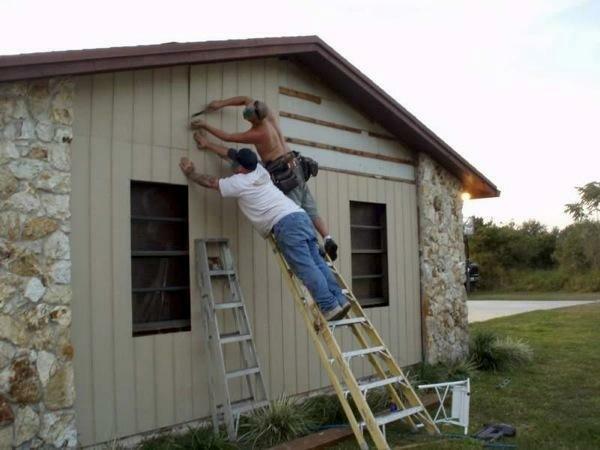 Nothing a couple dozen saw-horses and a ladder can’t fix! Let’s just hope nothing slips! Playing “Hoky Poky” with the wood chipper is never a good idea. Why, man? Why wouldn’t you use the shovel that’s in your hand? Granted, someone had to hold the board in place as it was hammered in, but this looks like an accident waiting to happen. I guess these gents were feeling close that day. High-rise construction safety rule #1: Remember what side of the building you’re on. The second rule would be to wear a damn harness to avoid the sure plummet to your death. At least it’ll be a pretty fall. Yes, it’s important not breathe in noxious gas…but it is still important to breathe! I can see how wrapping a plastic bag around your face would seem like an effective way to keep fumes from entering. 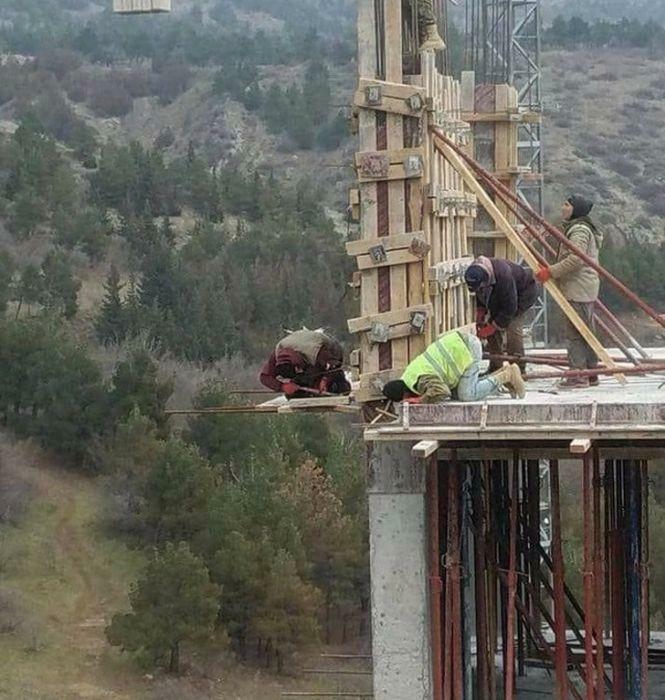 Who needs a harness when you’ve got power cables? 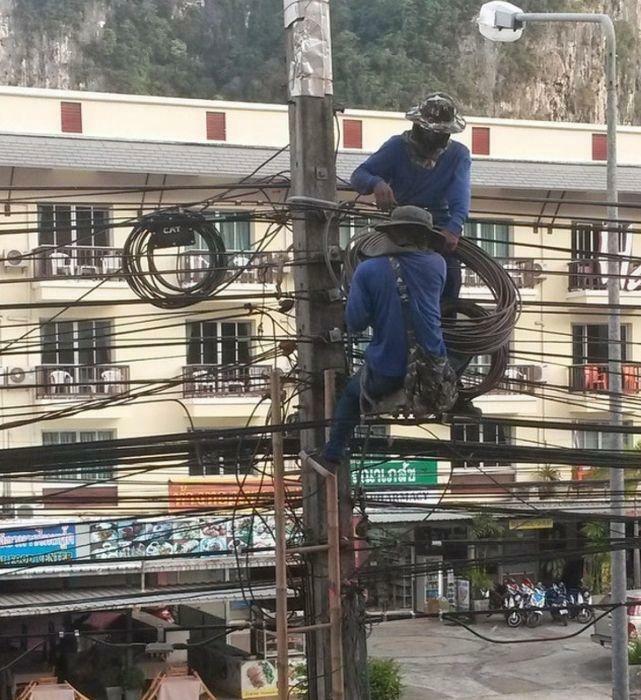 Both of these linemen didn’t see the need for any safety gear. I guess being fried by a live cable doesn’t seem like such a bad way to go. At least you’ll catch a buzz. These two are taking trust to the next level. Don’t mind the many tables all around; it’s quicker to use your friend’s back as a sturdy sawhorse. 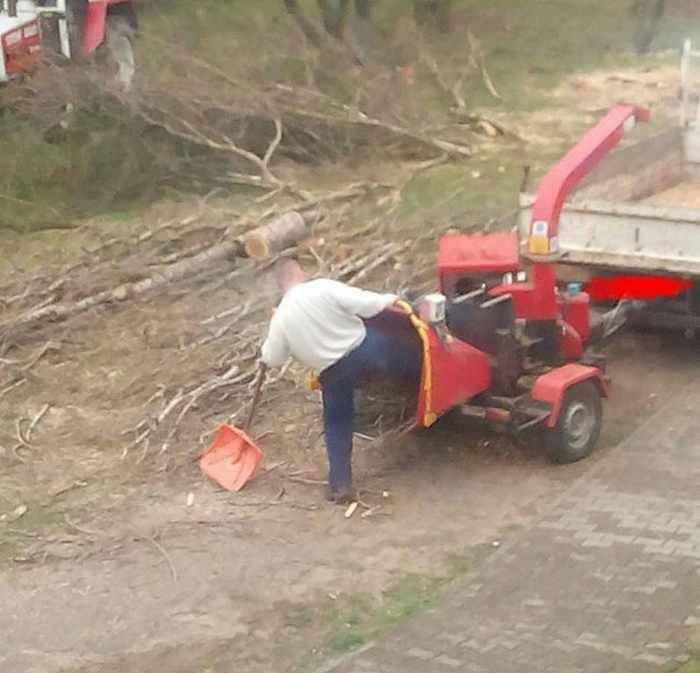 At least the operator remembered to wear his ear protection. Just a wee bit higher. This church ceiling was too high to reach, so she decided to giver herself a boost. 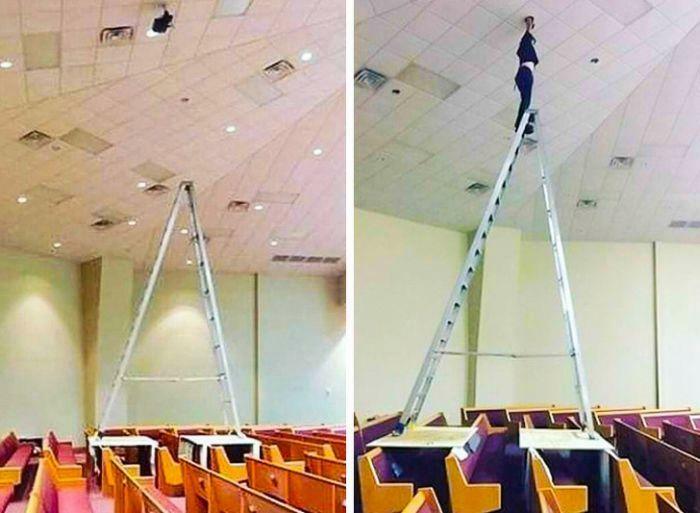 Using two boards balanced on the backs of the pews, she insanely balances the ladder on the boards for that extra lift. Friends never leave other friends hanging, unless it’s dangerous. This is a true pal staying hunched over while his buddy hangs out of the window for some minor adjustments. 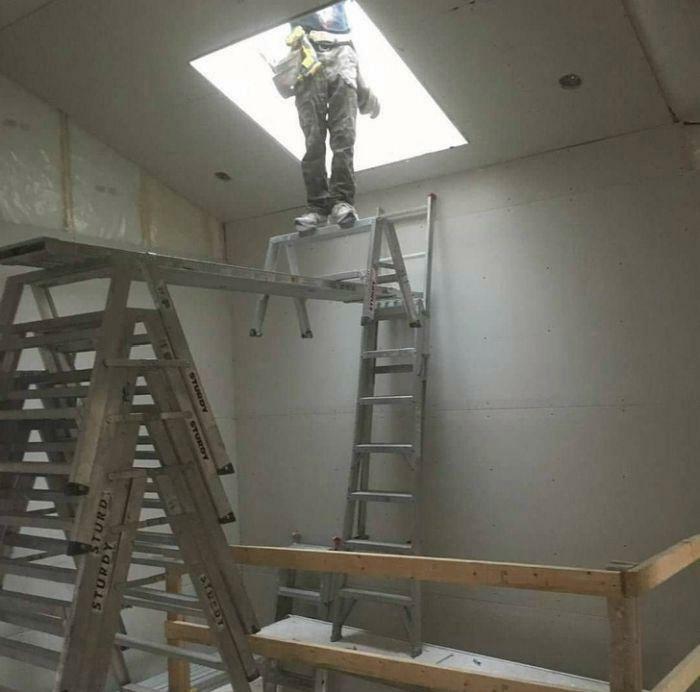 No need for safety gear, what’s the worst that could happen? This pair gives getting high a new and perilous meaning. 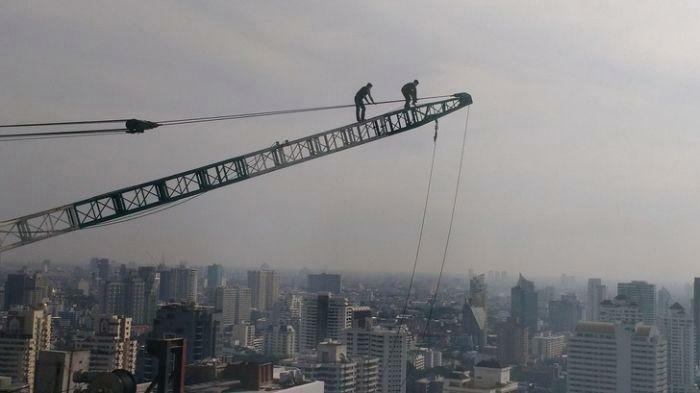 Dangling hundreds of feet in the air, these two construction workers scale a massive crane. If that isn’t terrifying enough, they are doing it without a safety harness and you cant trust that there isn’t a net beneath to catch them, either. A digger works just as well as a harness, doesn’t it? A construction worker precariously balances on the edge of a digger bucket to inspect a wall. His co-workers watch on in horrific anticipation. 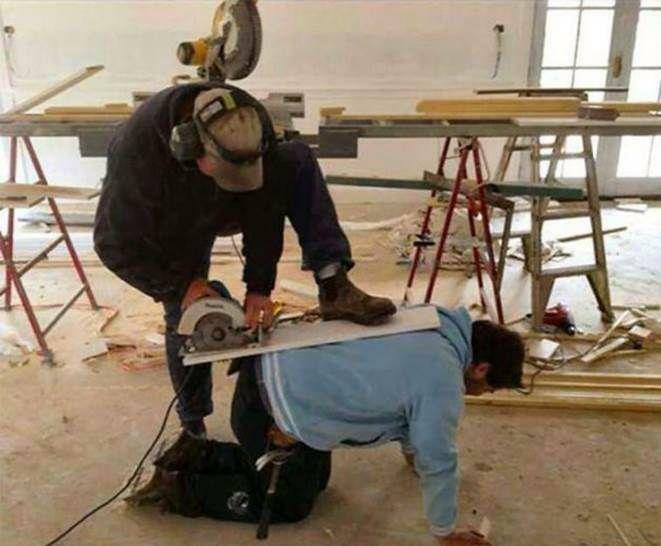 Why use a cutting table when you have two perfectly good legs? This man decides it’s not worth the effort of climbing down to cut his board to length. I wonder if that’s how it ended up the wrong size in the first place. 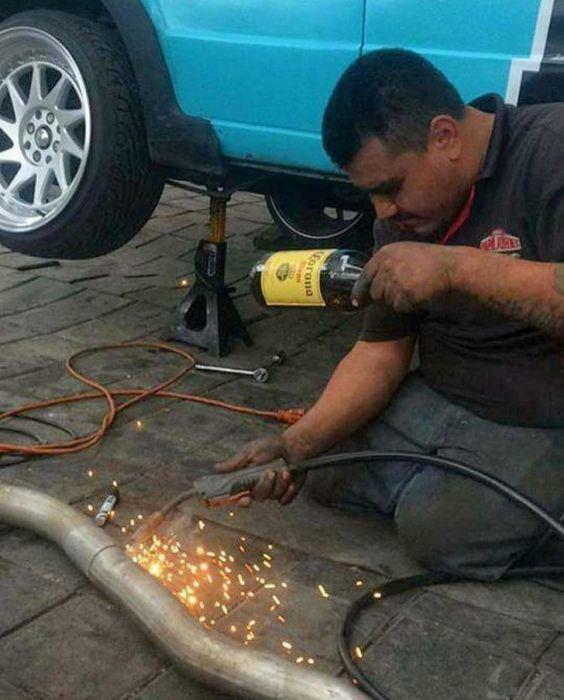 When you don’t have the tools you need, beer is always the answer. 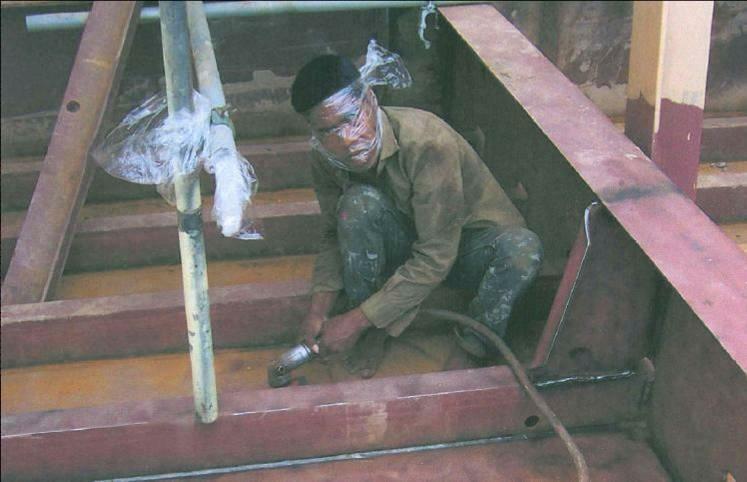 This welder didn’t have his helmet, but at least he knows the value of added protection. He keeps things safe by using a bottle of Corona to tint his view. Unfortunately, he can’t drink the beer until he’s done though. Sometimes paving the way takes some real ingenuity. 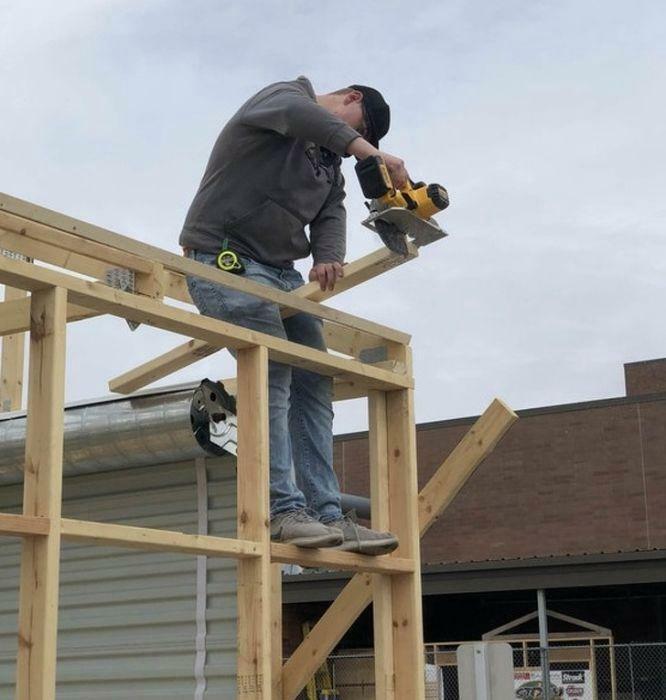 Major safety fails for this stud. 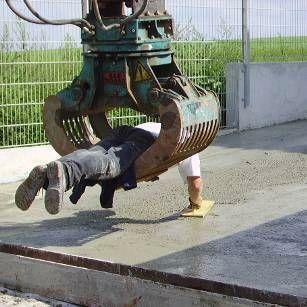 Seemingly beyond the fear of folly, he leverages himself over wet cement by dangling in a giant tractor claw. No matter how much safety is preached and drilled, sometimes you just gotta take the chance and find out the hard way.